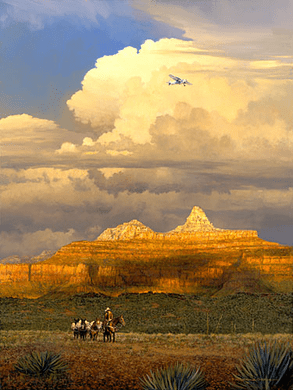 William Phillips Handsigned and Numbered Limited Edition Giclee on Canvas:"New Sounds in an Ancient Canyon"
About the Art: Pack mules and motors are sounds that have been heard in the Grand Canyon for only a blink of the geologic eye." Phillips' passion for aviation is second only to his infatuation with the American experience and the impact that the land, its people, its history and its values have upon one another. This is what he calls The American Landscape, paintings about a time, a place and the course of American events. The Grand Canyon is the iconic American landscape. For millennia, the only sounds heard in the Canyon were those of the elements and all things wild. As man arrived the sounds of early domestication could, only faintly, be heard. By the late 1800s, outfits such as Wellington Starky's Diamond Bar Ranch heralded the news that cattle was king, even in the Grand Canyon. Mining, rail and even the automobile would soon follow.